With iOS 7 to iOS 11.4, iPhone users are allowed to block any contacts from sending you annoying or spam texts. However, you may make a mistake to block the phone number of your friends and fail to receive his or her messages. We know how anxious it is to access these messages and see what they are sending. If you want a remedy for such situation, we are here to help. We will be talking about whether it is possible to retrieve blocked text messages on iPhone. Part 1. Is it possible to retrieve blocked text messages on iPhone? iPhone is known for offering the best kind of security. Once you block someone, there is no provision to see frozen messages on your phone. However, you can retrieve deleted text messages before they are blocked. And there are a few methods by which you can retrieve these messages. We will be sharing the details here. 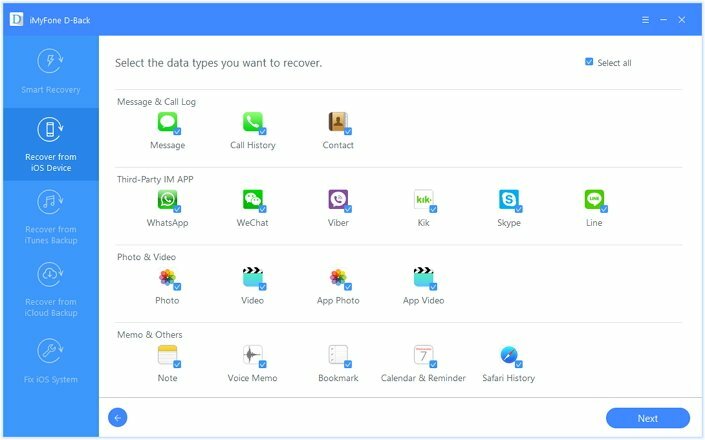 When you are looking to view and recover deleted messages on the phone, you can make smart use of a wonderful tool; which is the iMyFone D-Back iPhone data recovery. Let us familiarize you what this tool has to offer. 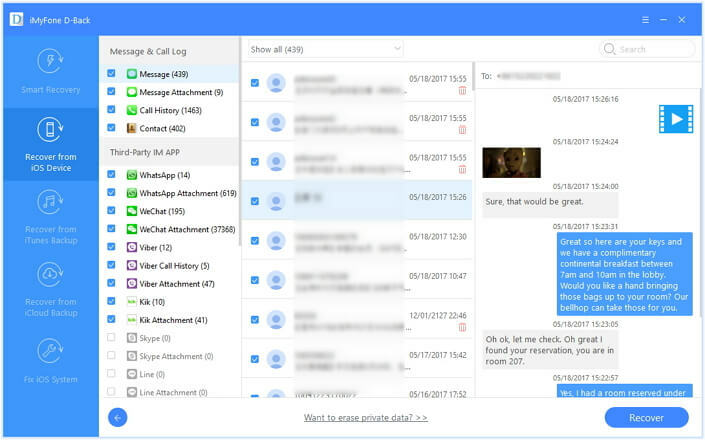 It can recover not only text messages but also the its attachments, just like photos, videos attached in conversations. It comes with 4 different recovery modes to choose from, which greatly improves the success rate of recovery. It is recommended by several famous media site, such as Cult of Mac, Make Use Of, 9TO5Mac, Techradar, engadget, etc. It offers free trial version to preview data from iOS device or from iTunes/iCloud backup. 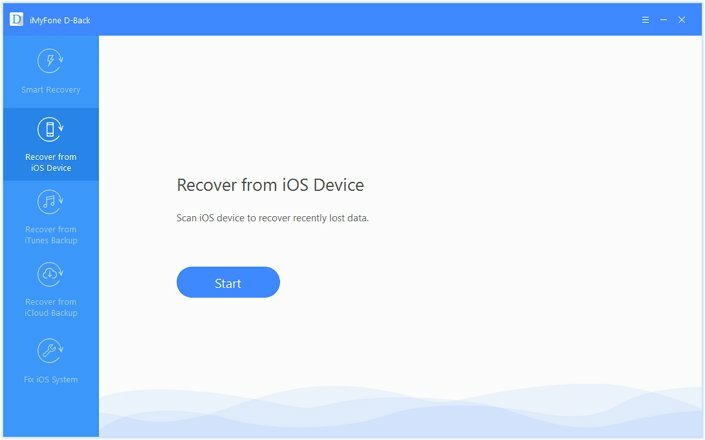 Now that we know the features, let us see how you can recover the data from your iOS device using this software. Download iMyFone D-Back iPhone data recovery on your system and install it. Start at the “recover from iOS device” tab and then hit ‘Start’. Make sure that your iOS device is connected to the same system. 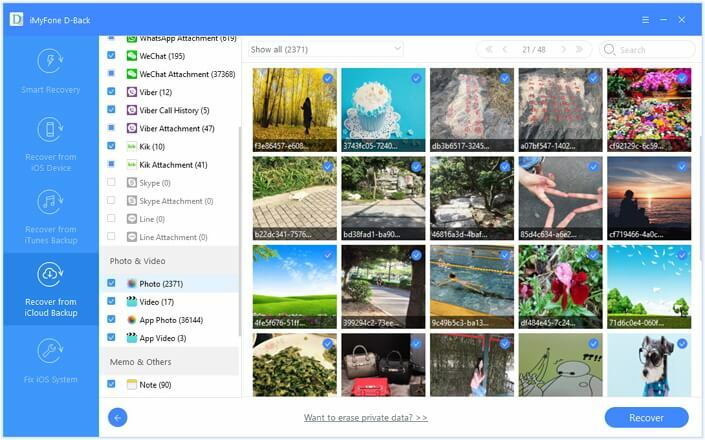 Now, you will be prompted to choose the file types you want to recover. As we are looking to recover blocked messages, we will select ‘Messages’ here. When the program detects your device, you will then need to click on ‘Scan’ so that the program starts to search the data which you need. When the scan is done, the result will be there for you. You can preview the files and choose ‘Recover’ option at the bottom then choose the desired location and save your files. Suppose your messages are stored in the iCloud backup, you can recover those too using this software. Let us show you how. Step 1. Download iMyFone D-Back iPhone data recovery on your system and install it. 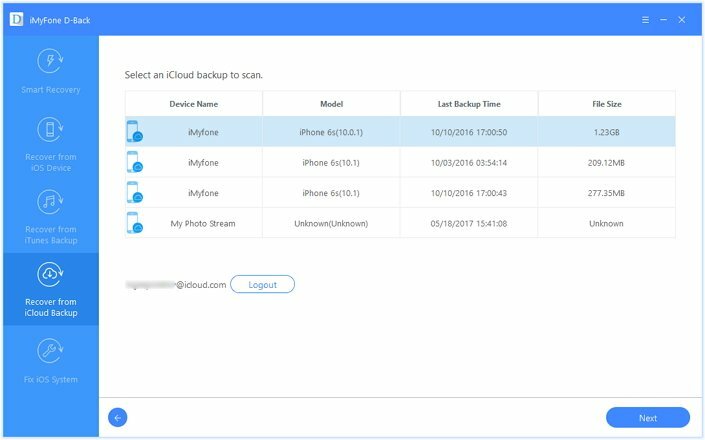 Click on ‘Recover from iCloud backup’ tab. Step 2. 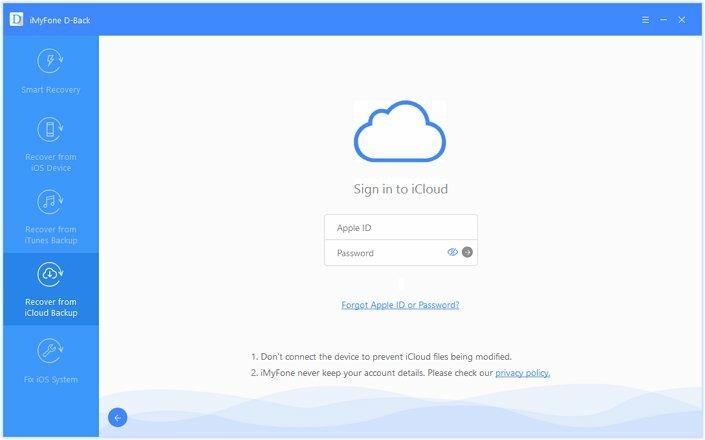 You will be asked to enter your iCloud login credentials. You can do it as iMyFone never stores the details. Now, the program will display all the iCloud backup files. You need to choose the ones you want to recover and then click on ‘Next’ present in the lower right corner. Step 3. Now, after the scanning is done, the content will be displayed to you. You can preview the content and then recover the messages by clicking on ‘Recover’ and then store them at the desired location. So, using either of the above two methods, you can access even blocked text messages easily. Now that you are familiar with the ways to unlock the messages, we would also like to talk about how you can block text messages in iPhone too. Here are some of the methods. If someone has been messaging you and you don’t even know who they are, here is how you can block it. You need to open Messages and then select the message you want to block and then you need to select contact followed by info and you then need to select ‘Block this caller’. You won’t receive any messages henceforth. If you want to block texts from someone who is in your contact list already, here is how you can do it. Head to ‘Settings’ and then select ‘Phone. Now tap on ‘Blocked’ and then select ‘Add new’. You will see all contacts in your list. Now you can select the people you want to block and then click on done. This will block messages from the selected people. Alternately you can also use blocking applications and firewall to block people from sending you messages too. So, now that you have all these details, you can block and even retrieve blocked messages as per your will. Things are definitely easier when you know the tricks!